The French Dada artist Marcel Duchamp was a member of artist Florine Stettheimer’s family’s inner circle. He is depicted here in the company of Rrose Selavy, the female alter ego that he invented in 1920. He casually carries out his game of sexual transformation by means of a contraption operated from an armchair. The clock and the chess knight are both Ducahmpian symbols: the one being a reference to the circularity of Dada time; the other an illusions to Duchamp’s prowess at chess. 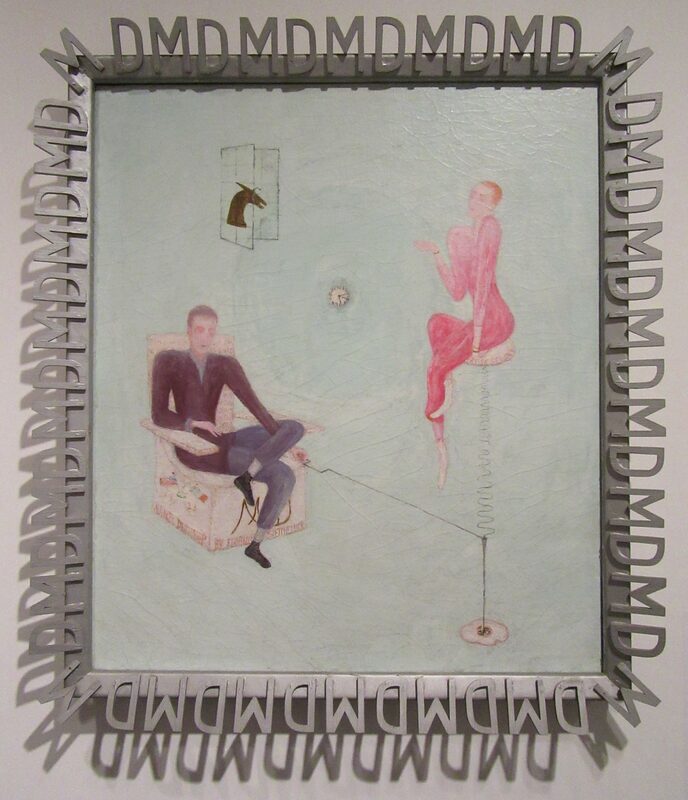 The frame (also by Stettheimer), composed of Duchamp’s monogram in a circle of infinite repetition, wryly comments on his program of artistic self-promotion and his obsession with identity and its ambiguities. Portrait of Marcel Duchamp and Rrose Selavy (1923) was Photographed in the Jewish Museum in Manhattan.